I think being a parent myself is a great asset to my job. I understand how difficult it is to be a parent myself, how you long to do the best thing for your kids, but so often its not obvious what the best thing is. How quickly or slowly to let go, to enable your child to learn for themselves, rather than be protected and told what to do? You also long to control the environment your child is in as much you can, to nurture and support, but lots of things are out of your control. An example that my husband and I have faced recently. Due to circumstances beyond our control, our daughter has just started at a school at some distance to our son's school. Both schools are within walking distance of our home, but it is not possible to do the school run to both schools on foot given the start and finish times. So, we were faced with the choice: school run in the car - creating pollution, congestion and missing out on exercise - or school run on foot, letting our ten year old walk a mile to school by himself, crossing several roads which at school times get quite busy. As you may know, there is evidence that kids who walk to school perform better. So, we have opted to let him walk to school and I have alerted my mums network to let me know if anyone spots any concerns about his road crossing behaviour! For now, the decision feels good. It is healthier and he is learning independence. But will I feel guilty and irresponsible if he has an accident? Organisations working with young people, face the same issues as a parent. How much can they and should they control the environment? How much risk should they let the young people take? There is evidence that young people naturally take more risks, it's hard wired into their brains. 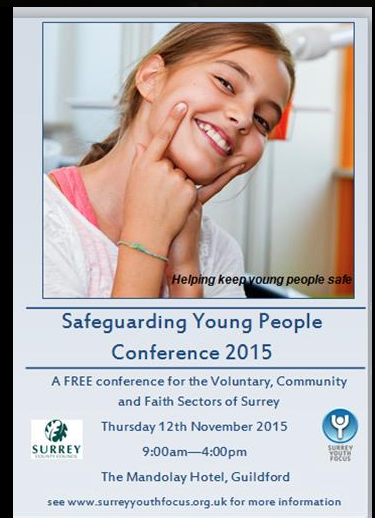 Ben Byrne from Surrey CC will be talking about this at our Safeguarding Conference on 12th November. If you haven't already booked a ticket, book now, thanks to funding from Surrey CC, we have extended the number of places at the conference, but still only have a few places left. Youth work on the pitch started on Friday night in Park Barn, Guildford. 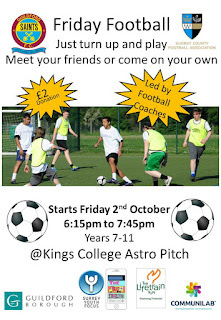 It is based on the Leatherhead Youth Project model of organising regular football sessions and having youth workers alongside to build relationships with young people, especially the ones most in need of a supportive adult relationship. The Guildford sessions have resulted from a collaboration of a number of organisations including Guildford Saints Football club providing the coaches, Guildford Borough Council providing the pitch, Lifetrain providing the youth workers, Kings College and Surrey CC youth worker marketing to young people, Surrey CC youth worker promoting, funding from the High Sheriff Youth Awards (looking for more though in case you know of any sources...), Active Surrey and Surrey FA providing guidance and kit, etc.The initial session on Friday night had 14 lads, a good start and a sign that this project is much needed in the area. I am, sadly, only talking about boys football at the moment. As a former footballer myself, I am hoping that they might get some girls football going too. (Personal plea - I would still like to find regular 5-aside women's football in the Guildford/Godalming area. 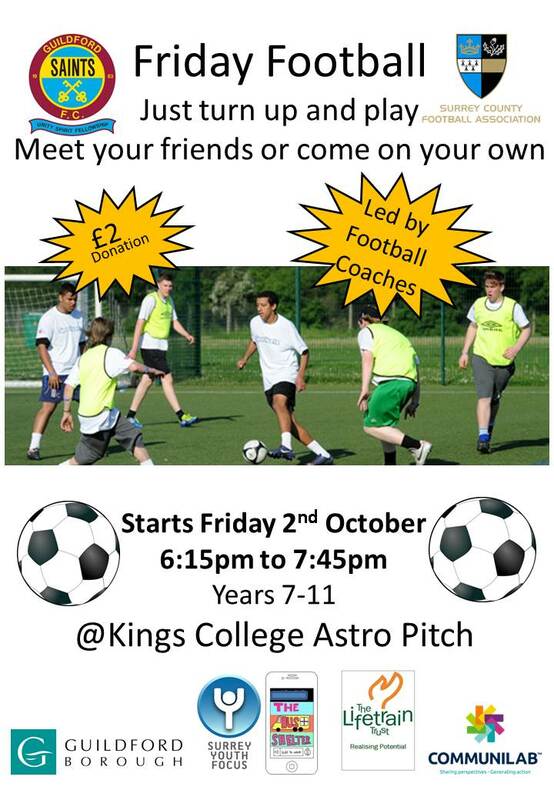 I don't have time to train or play 11-aside at weekends, but would love a quick one hour game an evening a week). Giving young people a voice...do they want it? We are increasingly getting requests from various local councils and other organisations to help to find out what young people want from their services and in their community. Some organisations want to consult with young people in depth whilst others are looking to us to speak on behalf of young people. We strongly believe that young people should have a say in public services and want to make this happen; many youth leaders that we meet feel the same. There are, however, several challenges with this. Like many situations in society, we need to find a way to get the voices of a variety of young people with different backgrounds not just the most articulate. We have amongst our 75 member organisations a very wide variety of young people, so working with our members, in theory we have access to a wide variety of voices. However, I keep hearing that young people don't want to be consulted, which has often puzzled me because the teenagers that I know are usually happy to express opinions. However, maybe it is because the organisations and their young people are all busy with their activities and don’t necessarily have the time or inclination to sit down and answer a survey, especially if they cannot see that anything is going to happen as a result of giving their time and opinion. I was heartened last week, therefore, when meeting with the Police Sergeant Adam Luck, who leads the Surrey police team with responsibility for working with young people in Surrey. He has a very different opinion - he hasn't found any difficulty in getting young people to talk. He ran a successful conference at Sandown Park a couple of years ago called SHOUT (Surrey Hear our Thoughts) where young people came and did a series of workshops giving young people a chance to air their views and concerns. 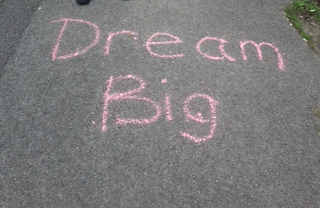 The difference was that the young people voiced their thoughts through a variety of means including interactive drama. The message that I took away from this meeting was to rid my brain of thoughts like “focus groups” and to start to think more creatively about active ways in which to work with our members to engage young people to give their voices. The other challenge that we have with this is, of course, finding ways to cover costs for our member organisations and ourselves to do this work. If you have any thoughts on giving young people a voice, do let me know. One of the challenges that we as a society need to face is that as we save more very sick young children such as those born very prematurely and as more people who have very bad accidents survive with major disabilities, we need to find a way to for them to have happy, fulfilling lives, in dignity and comfort, whilst at the same time working through and coming up with solutions to the financial implications. I had a good chat with Richard at Surrey Independent Living Council (one of our fellow tenants at Astolat). SILC is run by and for disabled people, helping them to live independently and to arrange the support and services that they require. On Thursday I went to visit the inspirational Dan Eley who has been in a wheelchair since an accident in 2010. Since then he has set up the Dan Ely Foundation which runs employment programmes for young people from poor backgrounds in Columbia - he is out in Columbia as I type overseeing the latest programme. 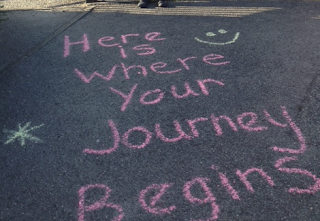 Dan believes that his life is more fulfilling now than before the accident. What a role model! On Saturday my children and I went to the Challengers special monthly swimming event at the waterslides at the Spectrum in Guildford. We went with close family friends who have a daughter with a disability. The session at the Spectrum is lovely because it gives young people with disabilities and their siblings an opportunity to be themselves and have fun in a safe space where, for example, it doesn't matter if a child blocks the way walking up or takes several minutes to decide whether they want to go down the waterslide. I feel a strong sense of community spirit with everyone looking out for each other's children. I do believe that we have made progress in society for helping young people with disabilities to live with more dignity and fun, but I also think that there is so much more that we can do - and by "we" that means everyone - we all have a role to play in ensuring that people with disabilities are welcomed into shops, into the workforce and into all aspects of mainstream society. I attended a briefing by the leader of Surrey County Council, David Hodge, last week on Surrey’s “Spending Power” for 2015 and beyond. It makes grim reading. Everybody I speak to seems to be in agreement that whatever flavour of political party or coalition is in Whitehall after the election there will be significant further cuts to local government budgets. Leaders in Surrey CC have further tough decisions to make on where the axe falls. Not a fun task methinks. So far, Surrey has maintained a much larger spend on youth provision than many other counties, but can it last? Meanwhile I am increasingly hearing from my voluntary and charity sector colleagues that they are receiving increasingly complex referrals (i.e. clients with a wider range of problems in layman’s terms). A third bit of news this week is some research reported by the BBC that suggests “Behaviour of boys from poor homes is worse when they grow up with wealthier neighbours”. I am not surprised to hear this, common sense says to me that if you are a teenager sitting in a class full of people with iphones going on skiing holidays it must be harder than sitting in a class full of other people with little money. 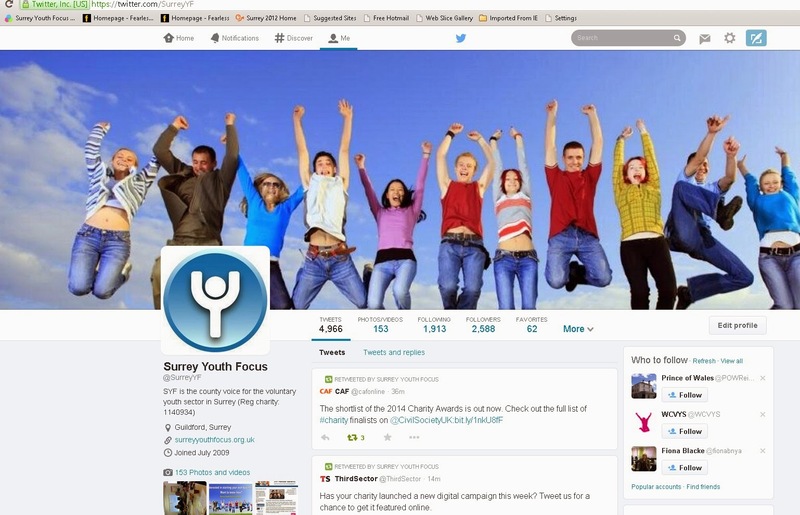 So, Surrey's young people from poor backgrounds need our support. Outcomes are so last year. Impact is the new way of showing that your organisation or service is making a difference, so I learnt at a meeting of Local Authority representatives and Youth Infrastructure Chief Executives held at the Cabinet Office last week. Why? Because measuring outcomes alone doesn't tell about your impact. WHY do we want to measure impact? Because it is evidence. Why do we want evidence? To support an assertion. What should we be using it for? To build confidence over time. What is evidence….experience, pictures, words, statistics. · You need to think about how you want to use the data. Have a think about other ways that you could use the data, to influence new potential funders that you haven’t influenced in the past e.g. lottery, businesses. · To measure your impact, it is recommended that you consider bringing a group of key stakeholders together to reflect on the questions. It gives you a major opportunity for dialogue. · Measuring impact is only really going to work when you have people all across the organisation bought in – including the CEO and the youth worker at the coal face. Often, youth workers are supremely unconvinced by measurement initiatives, yet can be the most evangelical if won over to the cause. 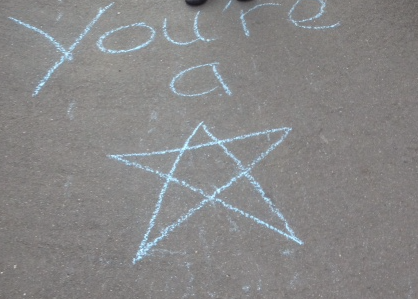 · When a young person’s life is changed, it will often be down to several organisations, perhaps a school and a youth group, rather than just one. We therefore need to talk about contribution rather than attribution - collective impact and collective responsibility. And if you want to start on this work, here is a list of questions to get your brain going…What is need? What is demand? Who is asking? 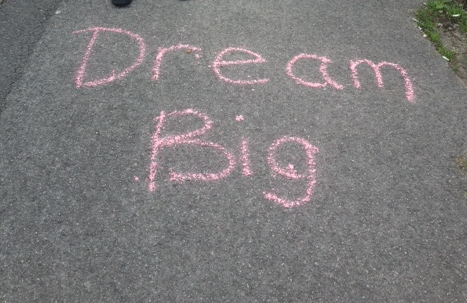 What are your big aims? What are you trying to improve? What are you trying to reduce? What assumptions do you have about ways that you work? Do young people stick with you? What do they particularly stay about for? If you are looking to change, where is the line between adapting and wholesale metamorphosis to being a new organisation? When are you no longer you? The sad events in France over the last week remind us of how complex some problems are and how they cannot be solved by one organisation. We (globally) need to try to understand why some people feel so angry and disenfranchised that they make life choices which are unimaginable to the rest of us. I deliberately haven’t used the word Islam because religion here has been misappropriated by people wanting to use it as an excuse to vent their issues with society, just as many atrocities have been committed in the name of religion related to the Northern Ireland conflict. These types of issues can only be solved when many parties get together to solve them. Governments cannot do them alone. Similarly, it is important in Surrey that we work to encourage our most disenfranchised young people back into mainstream society. Surrey County Council and the local boroughs cannot and should not be expected to deal with them alone. There are complex problems facing us in Surrey which can benefit from multiple organisations working together to solve. Going forward I very much see part of Surrey Youth Focus’s role as being too help people identify problems being experienced by our member organisations’ young people which are not getting solved. Our intention is to bring together a new set of players to help to solve them. The strong focus many corporates have on Corporate Social Responsibility (CSR) these days provides us with a new opportunity to help get long-standing problems solved. Do you have any problems facing young people in Surrey that you have been trying to solve for some time that could benefit from working with other organisations? Would you like help moving things forward? If so please do drop us a line, we would love to hear from you. Listening to the radio this morning about the drive to get parents to give their children less sugar, I reflected on a change in our habits that has helped on one level, but has potentially caused other problems. (Click here for more information on the campaign). Until recently, I was a full-time mum and used to frequently shop at supermarkets, often with one or both kids in tow. This meant that I was often subject to the typical requests for the sweeter cereals, for biscuits, etc. Now we are doing most of our shopping online, I am no longer subject to so many requests and it is easier to purchase more wisely without pester power. On the downside, however, the kids have less opportunities to learn about the shopping process and food ingredients now that they don’t observe it happening. True, they still sometimes see me cook, but it will take longer for the younger one to learn all the names of, for example, fruits and vegetables. As so often with technology, the challenge will be going forward to make the most of technology whilst overcoming any downsides. Often, however, the downsides are not easy to spot. With respect to reducing sugar consumption, I believe that it cannot be done by the strength of character of parents alone. I believe that a widespread change in society is needed, including regulation of food manufacturing and sale. If I could wave a magic wand over legislation, my first action would be to disallow sweets and sugary treats at low levels by checkouts. That would be one less pester inducing situation for a parent to negotiate. It is tradition to say “happy new year”, but this sometimes feels to general for me, so instead I will say that I hope that you have the new year that you want, whether that be happy, peaceful, spiritual, loving, relaxing, carefree, reflective, calming, fun, exciting, connecting, healing, comforting, joyful or maybe something else….